Download Planet 51 in Digital HD from the iTunes store. Planet 51 images are © TriStar Pictures. All Rights Reserved. Modern animation has benefited from two relatively recent technologies -- cheap computer animation and 3D. While the latter could be considered a gimmick (especially if the glasses give you a headache or you can't stand how they darken the colors), it is clear that people are taking animated kids' movies pretty seriously. My 40-year-old friends (and some 20-something year olds, I know) are happy to line up to see fare that is demographically pitched to my 7-year old daughter. When these movies work (such as Monsters vs. Aliens), they are light, humorous, with a standardized Hollywood moral and provide a reasonably good 90 minutes of entertainment for a broad spectrum of ages. When they do not work that well, they need to meet the minimum bar of entertaining my kid without being considered nightmare fuel. 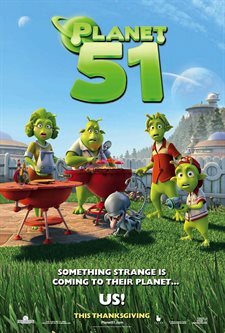 With these pretty-low standards, Planet 51 succeeds towards the bottom of the spectrum; my daughter liked it, and it didn't offend me or scare her. But that's a pretty low standard. 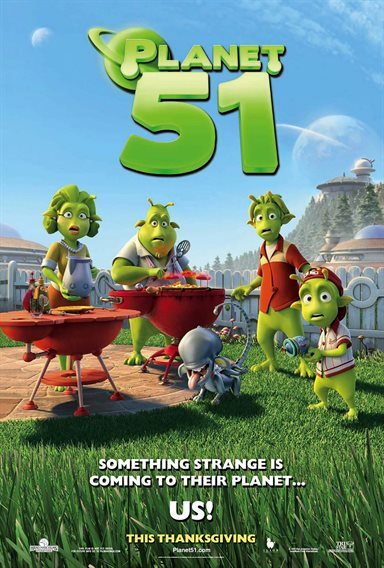 Planet 51 is a movie that runs on 2 and a half jokes. The first joke is that a human astronaut comes to an unexplored planet and discovers that it is inhabited by green aliens. Of course, he is the outsider; and they treat him like an invader from outer space -- which he is -- even if he isn't actually invading. The second joke is that the planet is an exact analogue of the American 1950's, and the astronaut voiced by Dwayne Johnson even gets this; he makes explicit reference to it. The half-joke is that there is an alien dog which is kind of one of the aliens from Aliens -- instead of bleeding acid, he pees it. This is not a lot to run a movie on, and by the end of its 91 minutes, it has worn its welcome a little thin. The movie riffs on 1950's alien invasion movies, has the 1950's aliens act like hidebound authoritarian 1950's bad-military guys, and has the small alien suburbanites wonder about mind-controlled alien zombies. All of these references went right over my daughter's head; but for me, they weren't especially funny or insightful. The place it fell down for me was when the human astronaut became a goofball screw up. Rather than him contrasting a more modern perspective to the xenophobia of the natives, he sort of justified their paranoia. If humanity would send someone like him 20 billion light-years across the universe, who knows what we would do to their planet when it turns out to have intelligent life on it? It also didn't make me want to root for him. Fortunately, there is a sympathetic character in the high school kid, Lem (Justin Long); but while the high school kids being the only sensible people is a 50's monster-movie trope, with the exception of his girlfriend who didn't get to do much, the whole cast came off as sort of blandly inept. I don't demand that kid's fare be insightful or even especially intelligent, but Planet 51 played out as a bland array of the same basic joke over and over while I waited for the obvious ending. I asked my daughter, as we were walking out, if the aliens lived at the same time as us, the future, or the past. She said the same time since they had movies and cars (even if the cars flew), and I think that is about right. Kids won't get the era references, and the movie works just as well without them. In fact, it works so well without them, that it makes you wonder if they are really adding anything to it in the first place.